I described how I typically dress for the cold and work in my post “Baby it’s cold outside” a couple of days ago. My goal in all seasons is to dress in a way that appears accessible and relatively effortless in the hopes that other people might want to give biking for transportation a try. To that end, on Tuesday I tried to dress for the cold without wearing any visible bicycle specific clothing. Chest: windfront Craft long sleeve base layer, white dress shirt, grey cardigan, heavy weight sports coat. The hi-tech Craft base layer allowed me to skip a windproof jacket. Legs: wool long underwear base layer, lightweight wool pants. Normally long johns are too warm for me to wear in the office without sweating all day, but with thin pants I was only a little warm during the day. Feet: THICK wool socks under black wingtip dress boots. Nothing says “accessible and relatively effortless” like a Santa hat. I think so, but my judgment has been called into question too many times. Short of approval from Roger Stevens, I will wear it with confidence given your authoritative concurrence Michael. You sir, are a figure most dashing on such a late fall day! You look good Dave, but I think you look a little cold, or just frozen in time, maybe. Looking good…but rather than not wearing heavy long johns due to fear of overheating at work, why not just change there close the office door or use the handicap stall. I’ve also found that wearing rain pants over “regular” pants really keeps you warm and clean for the ride in. True enough Will, an easy solution if you don’t mind changing. I am trying to come up with a clothing combination that looks business professional while on the bike and does not require me to change at work. 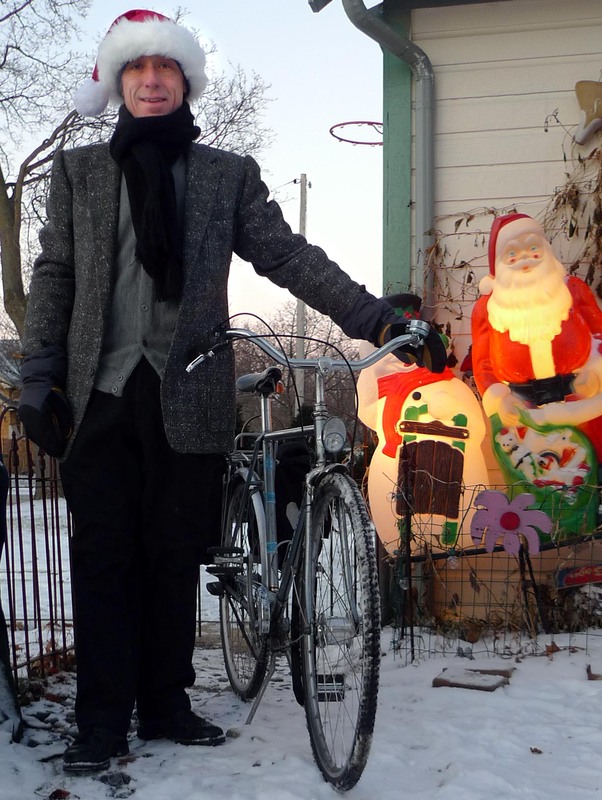 My goal is to promote cycling in regular clothes to make it appear a “normal” thing to do and be able to explain how easy it is, like walking to your car in the cold. I do wear rain pants over my clothes sometimes, but as I said, that is starting to look like expedition clothing to the non-outdoorsy crowd. Agree about using ordinary clothing. Just the helmet singles me out. I can afford Goretex, and may get a windbreaker or rainwear someday, but I’ve procrastinated. My $70 winter coat from Target has lasted several years. On top: 8 layers of normal clothing, most of it very thin. Bottom, three layers, thin. Finally have a pair of ski gloves that seem to work, tho I’m still experimenting with liners. Riding home last night @11degrees was not too bad – picked up a few places that need attention. That all sounds perfect to me Bill. And I kind of enjoy experimenting with different layering and fabrics. For instance, I have a really thick old wool sweater that I now know breathes way better than any hi-tech fabric jacket, even if it has pit zips. And I also now know that the sweater keeps me dry even when it snows (unless it is a sloppy snow). I only know these things because I tried them. Please do tell more about these Wingtip Dress Boots. Whose did you buy? And what sort of sole do you put on a boot that fits the profile of a wingtip AND allows you to ride bikes in them? I have some old Kenneth Cole black wingtip dress boots that I recently had re-soled because I wore them out. I don’t think you can buy them any more. But boots are super trendy now and lots of companies make wing tip dress boots. You can get a pair for less than $100 at Urban Outfitters, or if you want to spend the money (and probably get better quality) for Made in USA boots, Wolverine (1,000 mile collection), Redwing and others make very nice high quality dress boots. You are lucky you get too hot in long johns at work Dave- I wear long john’s daily for the short ride in and in the office at the BFW all day.